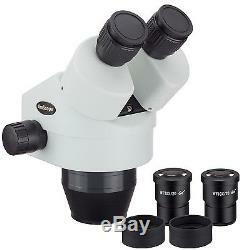 AmScope SM790B 7X-90X Binocular Zoom Power Stereo Microscope Head. Please note that we cannot honor warranties for other sellers' products! 7X-90X super widefield continuous zoom magnification power. Crystal clear stereo erect images over a super wide field view. Super widefield high-eyepoint 10X eyepieces with foldable eye-guards. 48mm (in diameter) female thread for adding Barlow lenses or lights. Mounting Size: 3 (76mm) in diameter. This is a 7X-90X zoom magnification binocular stereo microscope head. It includes a 2.0X Barlow lens, a pair of super widefield high-eyepoint 10X eyepieces and foldable eyeguards. It comes with 45 degree inclined 30mm eyetubes with diopter. 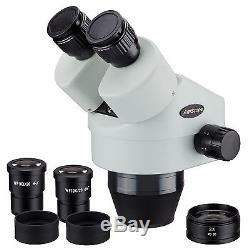 The microscope provides sharp clear erect stereo images over a large zoom magnification range. Its super widefield optics and high-eyepiont design ensure an easy and comfortable observation. This microscope head fits all the stands with a 3 (76mm in diameter) O-ring holder. 7X to 90X Continuous Zoom Magnification Power. 45-degree Inclined Binocular Head with SUPER WIDEFIELD High-Eyepoint Eyepieces. 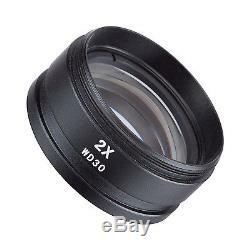 30mm Super Widefield WF10X/20 Eyepieces. High Resolution with Great Flatness and Contrast. Sharp Stereo Erect Images over a Wide Field View. Crystal Clear Original True Color Images. Both Ocular-Tubes with Adjustable Diopter. Accurate Alignment Ensuring a Fatigue-Free Viewing. Manufactured under ISO 9001 Quality Control Standard. Unbeatable Low Price Guaranteed or the Difference Back! Head: 45-degree inclined 360-degree swiveling binocular. Eyepiece: 30mm super widefield high-eyepoint WF10X. Interpupillary Distance: 2-3/4" - 2-15/16"(47-75mm). Field of View: 1-1/4 (33mm). Head Mounting Size: 3 (76mm) in diameter. Accessory Mounting Size: 1-7/8 (48mm female thread) in diameter. One Binocular Stereo Zoom Head. One Pair of SUPER Widefield 10X Eyepieces. One 2.0X Barlow Lens. One Pair of Foldable Eye-Guards. We offer 30 days from the date of receipt (verified by tracking information) to request a return on a unit. We appreciate your patience and understand everyone has a critical need for their unit, and do everything we can to ensure that these requests are handled as quickly as possible. Items damaged in transit are not covered by us. Include your order number, reason for return, and if any pictures are required for your claim, please include them also. Follow the issued instructions, and once received, we will process the item in, and check to ensure everything is there. Processing is done first come, first serve, and can take between 1-4 weeks to process (depending on how many requests we currently have in queue). We thank you for your patience while we work on your request. The item "AmScope SM790B 7X-90X Binocular Zoom Power Stereo Microscope Head" is in sale since Wednesday, March 30, 2016.